Vintage senior Alyssa Andrews eyes the basket against San Ramon Valley on Tuesday night. Vintage senior Kate Ilsley is defended closely by San Ramon Valley freshman Seren Nebres on Tuesday night. Vintage junior Morgan Groves, left, and Nicole Gleeson defend against San Ramon Valley's Breann Bruschke on Tuesday night. Vintage freshman Eden Wood makes a move to the basket against San Ramon Valley on Tuesday night. Vintage sophomore Victoria Solorio drives against San Ramon Valley on Tuesday night. Vintage senior Maya Sapienza, left, is defended by San Ramon Valley freshman Natalie Pasco on Tuesday night. Vintage senior Alyssa Andrews tries to draw a shooting foul against San Ramon Valley on Tuesday night. Vintage senior Nicole Gleeson, right, battles San Ramon Valley junior Audrey Bayston for the opening tip Tuesday night. Vintage senior Alyssa Andrews shoots between San Ramon Valley senior Claire Pasco (22) and freshman Seren Nebres on Tuesday night. Vintage head coach Joe Donohoe talks to his team during Tuesday night's playoff game against visiting San Ramon Valley. Vintage senior Alyssa Andrews puts up a shot against San Ramon Valley on Tuesday night. Vintage senior Alyssa Andrews drives baseline against against San Ramon Valley's Breann Bruschke on Tuesday night. Fans watch Vintage host San Ramon Valley in a girls basketball playoff opener Tuesday night. San Ramon Valley head coach John Cristiano talks to his team Tuesday night at Vintage. 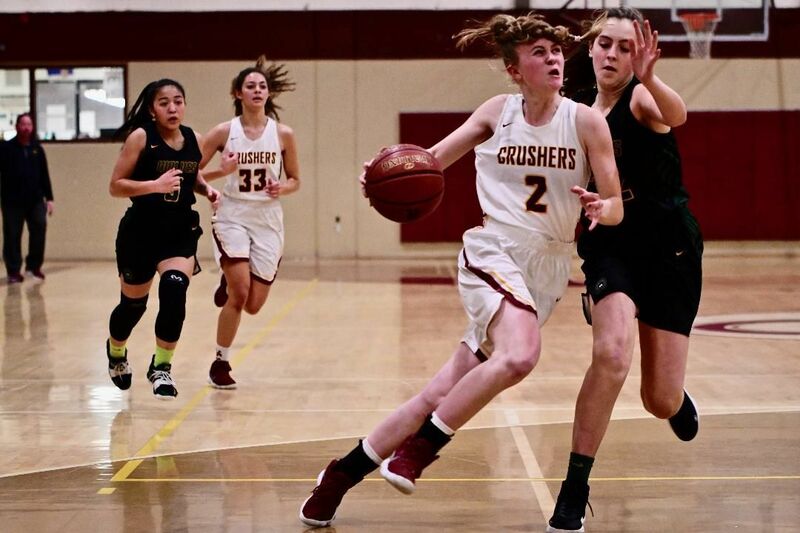 In a game that was much closer than the final score, the highly touted San Ramon Valley High girls basketball team got all it could handle from host Vintage as it won a CIF North Coast Section Division 1 playoff opener, 57-41, on Tuesday night. The Wolves came in seeded third, but after an entertaining first quarter, it was the 14th-seeded Crushers that had a 13-8 lead. The talented Wolves came in averaging a gaudy 76 points per game, but were held nearly 20 points below that average by the feisty Crushers. Donohoe admitted he was mostly upset that the ride was over for a team that accomplished something no other Vintage girls basketball team had – back-to-back titles in two different leagues. “I’m sad. I thought we had a shot here tonight,” he said. The Crushers played the Wolves nearly even for three out of four quarters. It was the decisive second quarter, when San Ramon scored the first 10 points and went on to outscore Vintage 20-6 for a 27-19 halftime lead, that ultimately made the difference. As was often the case for the Crushers, who finished 19-7 overall, it was Alyssa Andrews who led the way. The senior finished with 17 points and seven rebounds despite missing five minutes of the third quarter after spraining an ankle. Right behind Andrews was senior Nicole Gleeson, who once again showed she’s one of the fastest girls basketball players around. She scored 14 points, mostly on fast-break layups, and added seven rebounds. Vintage began the game with its aggressive 1-2-2 defense and the Wolves seemed to be off their usual high-scoring game, putting up only eight points in the first quarter. After San Ramon Valley opened the scoring, Gleeson scored four straight points and Andrews scored the next five helping the locals to race out to a quick 10-4 lead. To the Wolves’ credit, they gathered themselves between quarters and reeled off 10 straight points, and had an 18-13 lead just three minutes into the second quarter. Vintage center Kate Ilsley stopped the onslaught momentarily with a rebound and putback. But the Wolves kept the pressure on, and had turned a five-point deficit into an eight-point lead by halftime. Donohoe had said his team’s plan was to limit the Wolves’ possessions as best it could, and Vintage’s 29-19 rebounding advantage meant most trips down the court resulted in only one shot for San Ramon Valley. The Crushers began the third quarter in promising fashion, with Andrews leading the way. Morgan Groves sank an inside shot after a scramble for a loose ball, bringing the Crushers to within 29-25. But with 5:55 to play in the third, Gleeson picked up her third foul and Donohoe had no choice but to sit her down until the fourth. On top of that, Andrews had to leave the game a minute later for an extended period after what appeared to be a hard foul. To add insult to injury, no foul was called. With Gleeson and Andrews out, San Ramon Valley ran its lead back to 11 by quarter’s end. The Crushers didn’t give in, but the Wolves seemed to finally hit their stride in the fourth quarter to run out 16-point winners. Ilsley had five points and four rebounds for Vintage, Eden Wood three points and three rebounds, and Groves two points and six rebounds. Maya Sapienza grabbed six rebounds. Dellaina Morse, Ellie Savage and Victoria Solorio each had one rebound. The visitors were led by Natalie Pasco’s 11 points and Audrey Bayston’s 10.